Sometimes when you are georeferencing, you have to take executive decisions. 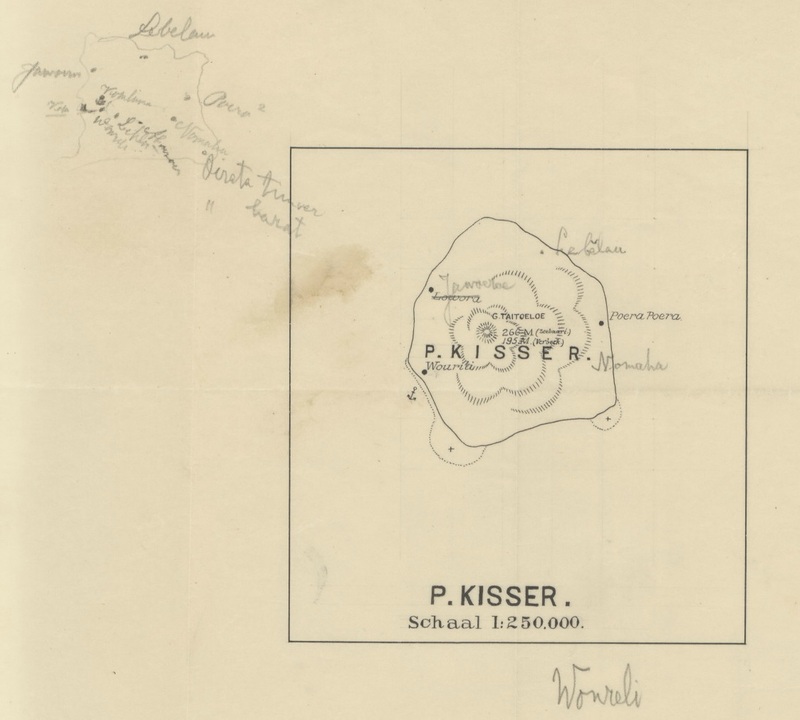 Last week one of our volunteers stumbled upon this map of ‘Poelau Kisser’, according to the catalog record an island in the Maluku Tenggara area. Soon the small island of Kisar was found. It is located just northeast of Timor. Now the georeferener looked at the island and the map and noticed the island on Google Maps looked much more like the pencil sketch than like the printed map. She was in doubt which map to georeference, but made the ‘executive decision’ to georeference the printed map, because it is interesting to see how difficult it must have been in the 1910’s to map a tiny island. Looking at the Google terrain map it seems highly unlikely that the island had a different shape back then. One wonders when the penciled map was drawn. It seems the user started by correcting the printed map, but soon found out the map was so far from reality, it was better to sketch a new map on a blank part of the page. The pencil corrections are probably made by Gerret Pieter Rouffaer, map librarian at KITLV and considered the last explorer of Indonesia (in his recently published biography). In 1910 he traveled to Timor from where he explored the surrounding islands. This blog is written by Heleen Hayes, on of our enthusiastic georeferencing volunteers. Rouffaer might be quite probable … Correcting the work of others was his favourite activity! I recognize the problem of executive decision. The line you can follow perfectly eludes georeferencing with shallow bends. A several times encountered situation where I can reference perfectly a line (rivulet, (rail)road, ridge), but not a point. The larger the maparea, the more difficult it is to map it accurately. Small maps (1:20.000) in mountainous regions mention mountainpeaks, but those are usually not to be found within the available maps. So I compare results with sites like http://mapcarta.com/Indonesia and http://www.gps-coordinaten.nl/ to obtain names of peaks, hamlets, etc. Most difficult to me are maps with coordinates, since the whole area seems to ” float away”. I have several times encountered Batavia as a referencepoint (I used 106d49m E), the “Meridiaan van Padang” (100d22m01.42s E), the Midd(en) mer(idiaan) Z(uid) Sumatra=3gr15m WL v(an) Batavia, but even then, sometimes after two, three hours of searching a wide area, when I finally find the location, it is far more distant from where it should be, than I can explain by crudeness of the maps. One map (1943, based on a Dutch map from 1892) mentioned Declination, a difference in True North and the magnetic North, which in 1943 was 15 minutes or 4 miles. And earthquakes have rippled the area. So, there are a lot of these Executive Decisions. And they are fun! But still, I can’t reference some of these maps, though I can point precisely to the mapped terrain. For me the coordinates 100d48m27.79s work best for Batavia.